Join us for a 3 day portrait painting & yoga workshop this March in my private studio in Costa Mesa, CA! Yes, it’s super soon! I will demonstrate my approach and talk through each step. Go over the thinking behind problem solving from start to finish in a 4 hour sitting with the live model, snacks and refreshments provided. We will do a 1 hr yoga class in the studio, lead by Dr. Jessie Painter. It will be an all levels yoga flow. After yoga we will begin painting from the live model. I'll guide students from start to finish covering all of the fundamentals of painting and give individual help and attention. *During the breaks Jessie will give helpful yoga exercises and tips for artists!! Space is limited.. we are very excited. Hope you can join us!! Materials list and address will be emailed. Painting a portrait is rewarding and fun but can be overwhelming if your comprehension of the facial structure is lacking. In this class we will deconstruct the portrait. Each week we break down each facial features, focusing on the structure of the individual parts: the skull, eyes, nose, ears and neck.. We will work from hand outs and photo reference each week but The last day we paint from a live model. Using the knowledge acquired from the last classes you will have a better understanding of the design and structure of the face and how the parts that fit together. Each week in this in depth workshop you will break down facial features, focusing on the structure of the individual parts. You will work from references and the live model. Painting from life and frolicsome fun! 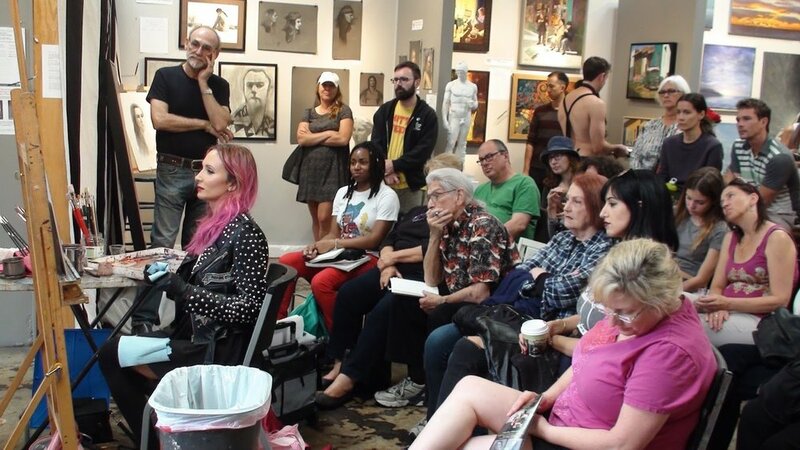 TEACHING A CLASS IN LA at Kline Academy of Art !! 2 days painting from a live model!! All students receive a special handmade gift -A sparkle Painting apron and note folder!! Dress up (or not) & start the new year off being happy,productive and creative!!! All my girls will be here painting! This will be unique, experimental, but we will be painting like mofos! The Workshop will take place at the Loz Feliz Life Drawing Studio. In this exclusive class you will learn how to use simple but alluring Alla Prima (wet on wet) painting techniques combined with other unique methods to create a polished composition with photo references. This class is fitting for students who are interested in bridging figure or portrait painting into narrative personal work. It is designed for students who wish to construct complex/personal paintings based upon classic, archetypal (or contemporary) compositions. Only 3 students accepted at a time.